The Lyot Project is a 3 year instrumentation effort involving the construction of the world's first optimized, diffraction-limited stellar coronagraph, and the deployment of that instrument at the US Air Force AEOS Facility in Maui. The Lyot Project's technical goal is to take Lyot's original invention, the coronagraph, to the physical diffraction limit, the limit imposed on a telescope's image resolution by the physics of light. Once that is achieved, we will pursue new coronagraph ideas and improvements, while surveying the brightest, closest stars for anything in orbit about them. The Lyot Project's scientific goal is to take pictures and ultimately spectra of faint companions of nearby stars and disks of dust that may be orbiting these stars. Photo of the interior of the clean room in the Astrophysics Laboratory at AMNH. 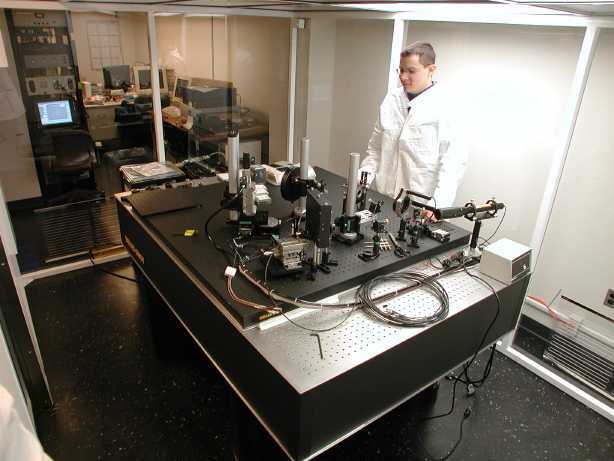 This photo, taken in February 2003, shows the partially assembled coronagraph, on the square, black breadboard sitting on the optical bench. The coronagraph will include numerous other components that are not shown in this photograph, and will be enclosed with a large metal case, to control airflow around the optics and to protect the system during shipment from New York to Maui. The electronics rack that controls the precise positioning of the optics can be seen in the background, outside the far wall of the clean room. The Lyot Project's coronagraph began as an idea in 1999, when a new opportunity arose due to a collaborative agreement between the National Science Foundation and the US Air Force. This on-going agreement, funded jointly by the NSF and the USAF Office of Scientific Research, made the unique capabilities of the Air Force's AEOS telescope available to civilian astronomers for basic scientific research. Our team investigated the potential for using this facility to address the problem of imaging exoplanets. Images of stars made with the AEOS adaptive optics system and telescope are uniquely high-quality, coming within 85% of a perfect image made with that telescope. For comparison, other telescopes with adaptive optics systems routinely reach 50 to 60% perfect images. Telescopes without adaptive optics are doing well if they reach the 1% level. This extremely high quality imaging capability means that a properly designed coronagraph placed behind both the telescope and its adaptive optics system can reach unprecedented sensitivity to faint objects next to bright stars. As a result, we simulated what such a coronagraph would do. The simulations formed the basis for designing a real optical device that could be built and installed at the telescope. This device includes both a coronagraph (built at the American Museum of Natural History) and an infrared camera (which we call Kermit, built at the University of Hawaii and the University of California at Berkeley). The design of this system is described in the next section, "Instrument Design." A brief description of the telescope and links to the telescope's website are provided in "The Telescope (AEOS)" section. What we can do with the new instrument is described in "Capabilities."